In a large pot, bring ramen noodles, half of the ramen beef seasoning packet, diced tomatoes, and water to a boil. Cook until the noodles are softened, about 3 minutes. Remove from heat and pour into two serving bowls. Sprinkle remaining ramen beef seasoning over the canned chicken. Place half of the chicken on top of the ramen in each bow. Heat corn in a small, microwave safe bowl until warm, about 1 minute. Place on top of ramen in each bowl. 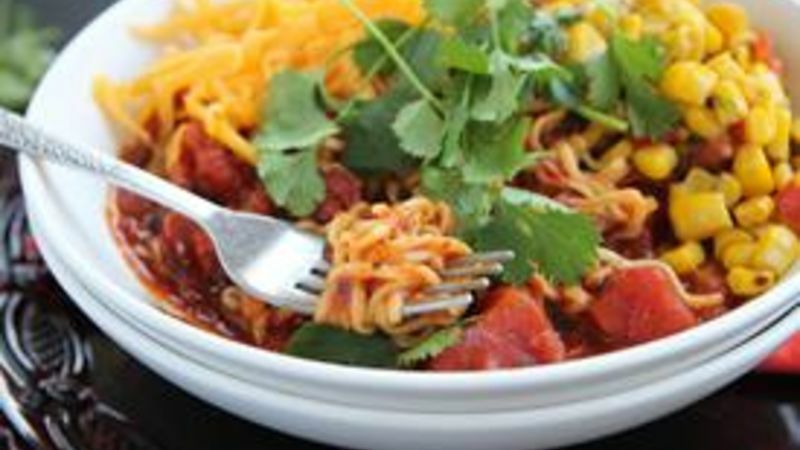 Top each bowl with cheddar cheese and cilantro. Serve and enjoy! Remember ramen from back in your college days? Meh no more! Check out what we've done to bring ramen into the flavorful fold! Super cheap, crazy easy to make, but kinda lacking in real flavor -- that's the ramen we all knew in college. Well, we’re putting ramen back on the menu, but pimping it out to the max! You won’t be embarrassed to serve these 8 fabulous ramen recipes to your family and friends! Let’s start with a little south of the border flavor to give your ramen some kick -- I promise you’ll love it. Now here's a fave flavor that makes ramen noodles brand new. Check it out, then check it off your to-do list! If Mexican food is what you crave, this ramen recipe gets you there without any fuss -- just a steaming bowl of perfectly spiced noodles. Here’s what you’re gonna need for an A+ super supper. Now, channel that college kid in you and dump the ramen and flavor packet in a pot. Here comes the spicy part. Pour some Old El Paso taco seasoning in the pot -- as easy as cooking back in the good ol' college days. Add your fire-roasted tomatoes to the pot and cook until steaming. Brilliant! Pile your steaming bowl of noodles high with grated cheese, shredded chicken, and steamed corn -- 'n your done. Pure genius! Make Italian night easy with this zesty stovetop dinner. Ramen never tasted so good! This recipe takes plain old ramen and gives it amazing Thai flavors with just 4 ingredients. So simple, so filling, so good! This Asian beef stir-fry is loaded with good-for-you veggies. In under 30 minutes, you’ll have a meal way better than your college pot of noodles! Ramen noodles add crunch to this awesome salad in their uncooked form. With packaged coleslaw mix, ramen noodles, and bottled dressing, this salad comes together in minutes. Get a healthy, hearty meal in minutes with this Pad Thai recipe. It’s full of wholesome vegetables and coated in a creamy, salty sauce that hits the spot. Curly ramen noodles are just what your chicken soup ordered. This soup is comfort food at it’s easiest and tastiest! Make this next time your old college buddies visit -- it’ll be the best ramen they’ve ever tasted, and it's sure to bring the stories out in everyone! Bursting with fresh herb flavors and brimming with vegetables, this recipe can’t be beat.